Determined to use up my pile of waste paper, I made more booklets. The covers are made of pages from back issues of Domino magazine. Nice. And as a special feature, one interior blank page has a wee dot of blood on it from my thumb, when I poked myself with a staple. Awesome. I've been using my used paper in spiral tablets or for my sketching paper. It is a great way to get a second use out of the paper. 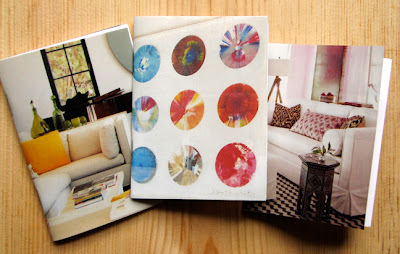 Very cool to see you making awesome booklets out of yours! Cool idea with using the magazine images. Thanks to your post, I had the perfect solution to a boring afternoon at work yesterday. I raided the recycle/scrap paper pile, made several booklets, and looked like I was busy in the meantime. So thanks! Love, love, love it. So clever & adorable. I'm swimming in paper in my office & never seem to have it anywhere else... sounds like you. Can't wait to make some of these! Such a cute idea! I am going to make some this weekend. I love your blog and read it often. I have taken many ideas from you. (Thank you! )Please keep up the good work. What a cool job if you have time to do this neat stuff. I gotta get me a different job! Maybe when I retire from the clinic I will have time to try your fun Idea. Keep up the good work. I loved your original idea, but this tops it with the magazine covers!! What a cool idea, now I can put some of my old magazines to use one more time before they hit the recycle bin. Thanks! Yes, these are so cool! I haven't tried making them yet, but I will...and I sure could use one in my purse! Thanks for showing me a great way to use up some of the paper I'm addicted to buying! I made one of those envelopes with the template you gave on your blog and it was SO cool!!! Thanks! I love your ideas.